Since our establishment, Godsend gained a lot. Especially in the new energy vehicle application, cooperating with several vehicle enterprises, we have designed dozens of types new energy vehicles permitted by MIIT(Ministry of Industry and Information Technology of China) . We are national high-tech enterprise as well as Hanghzhou key enterprise. We have one provincial R＆D center, and one municipal technology center. Godsend brand is Hangzhou famous trademark. 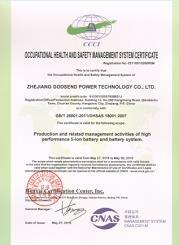 We have set up safety production management system strictly in accordance with national standards. We have passed ISO/TS 16949:2009 and ISO9001:2008 quality management system certification, OHSAS 18001:2007 occupational health and safety management system certification and ISO 14001:2004 environment quality management system certification. We are facous on innovation and particularly put attention on intellectual property protection. 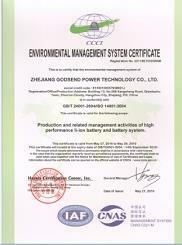 We have developed many types of batteries and right now have been authorized 37 patents of invention and innovation. 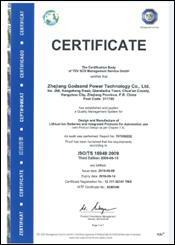 We have won the European CE certification and UN38.3 certification, as well. Godsend’s LFP battery and NCM battery have passed the mandatory test at the National Car Quality Supervision and Inspection Centre. And the modules, packs have passed thermal runaway. Some standard battery systems have passed strict mandatory tests incluing vibration, salt spray, fire, over-charge and over-discharge protection, etc. Those tests prove our battery exhibits not only good electochemical property but also reliable safety performance. 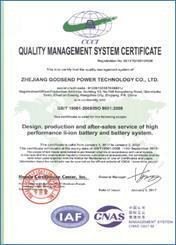 We have a lot of experience in battery reliability assessment. So we have become one of main drafting committee of national standards of new energy vehicles battery and battery system.